At San Marcos Toyota, we have trained technicians on-hand, ready to service your Toyota vehicle with the care and attention that it deserves! Looking for a Central Texas dealership where customer care is a priority? Then come to do business with San Marcos Toyota: The Right Dealer For You. Our Toyota dealership in San Marcos, TX, isn’t a high-pressure dealer. We welcome Hill Country drivers with a smile and treat them to a transparent, friendly and successful dealership experience. 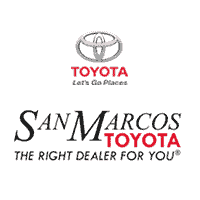 San Marcos Toyota has been a member of the San Marcos community for 18 years, so you can count on our family-owned and -operated Toyota dealership to go above and beyond for you. When you arrive at our local Toyota dealership, you’ll find the full Toyota model lineup waiting for you. Whether you want to lease a new Toyota RAV4, buy a new Toyota Camry or test-drive a new Toyota truck like the Tacoma or Tundra, you can do it and more on our lot. We also stock a competitive selection of used cars that vary in make and model. You can easily buy a used Toyota Corolla, or reduce your carbon emissions with a pre-owned Toyota Prius. San Marcos Toyota even stocks Certified Pre-Owned Toyota vehicles, so you can buy a CPO Toyota Highlander, too. Just speak with our talented Toyota financing team and we’ll locate the perfect Toyota lease or loan for you! If you’re visiting our San Marcos Toyota dealership for Toyota maintenance and repairs, know that we offer both Toyota Express Maintenance and a Toyota-Certified Collision Center. Whether your car needs an oil change, tire rotation, brake inspection or other Toyota repairs, we can see to them quickly and get you back on the road. Our Toyota service center works closely with our Toyota parts center to ensure we’re even using genuine Toyota parts where we can during the repairing process. Once you stop to consider the value you’re getting at San Marcos Toyota, it’s clear that we’re The Right Dealer For You. You can visit us at 5101 I-35 in San Marcos, TX, which is only a short drive away from New Braunfels, Kyle, San Antonio and Austin, TX. Make the trip today and come be treated right!